Tom is a doctoral student at Birkbeck, University of London. His current research focuses on medieval literature and its appearance in manuscripts, textiles, and wall paintings. Tom also writes on ecology and sound art, and is currently editing a thread titled 'Ecocriticism Now' for online journal the 'Glasgow Review of Books'. 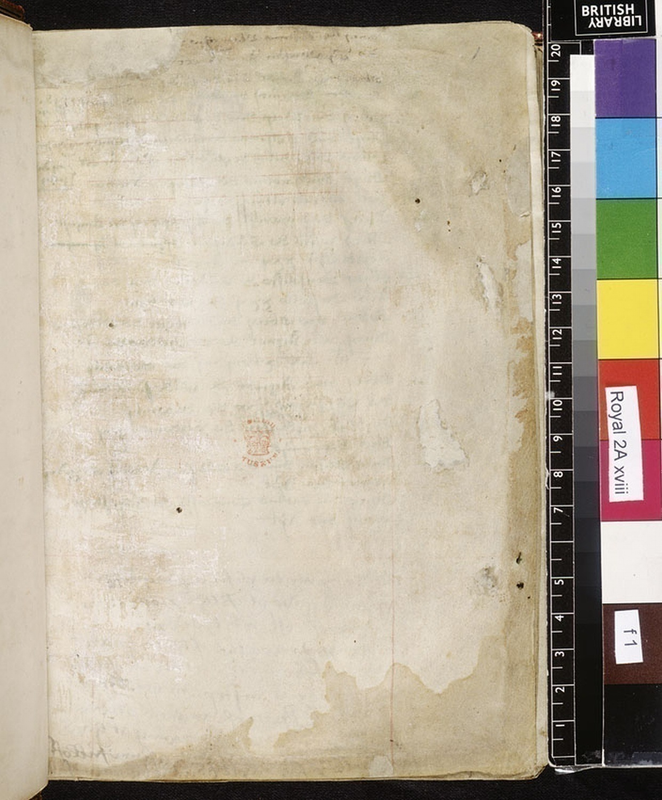 The page above seems unremarkable: devoid of textual content, described as “blank” in the accompanying British Library description, it appears to have been written only by the unguided hands of time and decay. The stains and other marks attest to the use of this parchment folio as a flyleaf, the first of two at the start of a fifteenth-century manuscript. Flyleaves were often left at the beginning and end of a manuscript to protect the rest of the text from damage; while many remain blank, others became a prime location for ownership inscriptions, rough drawings, and other doodles (manuscript scholar Erik Kwakkel has recently blogged about flyleaves here). At some point in this folio’s early history it was prepared for text; rulings for a text block in red crayon are faintly visible at the top of the folio and towards the bottom right corner. While this text block remains unfilled, the writing on the verso side of the folio shows through on the recto, its spectral presence emphasising the enduring absence of text on this side of the folio. More recently, a British Museum stamp has been added close to the centre of the page, a mark of the manuscript’s final resting place and, by extension, its incorporation into modern schemes of foliation, description and cataloguing. Despite its designation as “blank” in the online catalogue then, it would seem that there are still things to say about pages like that of fol.1r of British Library, Royal MS 2A xviii. The page above has been something of a departure point for work I have been doing recently on the blankness of medieval writing surfaces, particularly in fifteenth-century English manuscripts. While it is not uncommon for manuscripts to include “blank” leaves, I have come to think that what such leaves show is that the space of manuscripts is not, in fact, absolutely blank, at least not in the sense that that word has come predominantly to occupy. That is, the blankness of medieval manuscripts is of a different order to the chemically-induced whiteness of a modern sheet of A4 paper, or the pristine virtual whiteness of a word processing document on a computer screen. As well as tracing the etymology of “blank” and its overlap with “white” then, I have been considering just how blank the leaves of manuscripts really are. The parchment and paper used in fourteenth and fifteenth-century manuscripts preserve numerous instances of what Joshua Calhoun has recently called “ecological remainders” (“The Word Made Flax”, PMLA vol.126 no.3). Calhoun’s focus is on sixteenth and seventeenth-century printed Bibles, but the manuscripts of the fourteenth and fifteenth century arguably provide an even richer record of the ways in which the page might reappear as something more than the unmarked substrate of inscription. The labour-intensive, time-consuming practices required to produce medieval folios resulted not in pristinely white pages, but rather multihued surfaces that, before the addition of any textual content or evidence of their passage between scribes and future readers, preserved the memory of their previous existence as animal skin or plant matter. To produce parchment, skins were washed, soaked in lime (calcium oxide, obtained by heating limestone and combining the remnants with water), washed a second time, dried under tension, and then de-haired. The occurrence of scar tissue or holes in the page as a result of pre-existing injuries to the animal often required scribes to curve or separate their writing. Such holes could also be the result of parchment makers pushing too hard with their tools while removing hair, a reminder of the labour-intensive processes required to turn animal skin into a surface receptive of crayon, ink and gold leaf. On fol.7r of Oxford, Bodleian Library, MS Rawlinson D. 101, a manuscript of travel narrative The Book of Sir John Mandeville, a hole equivalent in height to around three and a half lines of writing has been incorporated into the scribe’s copying of the text. On fol.7v though, the scribe was forced to split the word ‘relykes’ [relics] around this hole in the page, ‘re’ on the left side and ‘lykes’ on the right. This flaw in the page results in a fortuitous yet apposite combination of text and manuscript materiality: in a section of the Book of Mandeville that ironically details the multiplicity and brokenness of medieval relics and the competing claims of veracity attendant on them, the word ‘relics’ has itself been cleaved in two. Medieval paper was made from cellulose; flax, commonly in the form of linen, was obtained as cloth rags. Linen was itself difficult and time-consuming to prepare: before the process of spinning could begin, the flax was rhetted (soaked in water or dew in order to separate the fibre from the stalk); broken (beaten with wooden mallets); and then drawn through a hackle (a device resembling a bed of nails). Before it could become a writing surface, linen had already undergone a lengthy process of production and an even lengthier period of inhabitation or use. To make paper, the collected cloth rags were fermented in vats for six to eight weeks, in order to weaken the fibres. This material was then beaten to a pulp before being cleaned. A screen tray papermould constructed of vertical and horizontal wires (chain-lines and laid-lines respectively) was then covered in a layer of pulp; this wire screen at the bottom of the mould retained the pulp but enabled excess water to pass through. A removable rim known as a deckle set the size of the sheet. Once set, the sheet was added to a pile and then pressed to remove as much remaining water as possible. After repeated stacking and drying, the sheets would be coated in size, a substance made from boiled fragments of parchment and leather. The slightly brown or yellow hue of many paper folios is evidence not of the discolouration of a whiter original condition over time, but rather of the retention of these colours from the process of production itself: the paper produced at mills alongside particularly muddy rivers, or during the wet spring months, would preserve this fact in their hue. Further, on occasion fragments of organic matter that had made it through the paperman’s vat and mould resurface in the page; small knots of flax or single hairs can be found in medieval and early modern paper books. The use of fragments of parchment to produce size is one instance of what might be thought of as the circling or looping nature of the ecology of textual production and consumption from the medieval into the early modern age. Just as fragments of parchment might be recycled in a variety of ways, paper was only one form flax could take in an extended series of use and reuse: flax became clothing or canvas which, when worn out, might then be used to produce paper. In turn, books might be read to rags, which could be added again to the vat to produce new paper, or could be further broken down and used as fertiliser for growing more flax plants. Even without text then, the leaves of manuscripts are legible in a certain sense. Once a medieval scribe had added text to these leaves though, it was not uncommon for them still to include “blank” (i.e unwritten) spaces. Manuscript digitisation projects have tended, initially at least, to focus on illuminated pages that are well planned and laid out, richly arrayed, and complete. However, for all such pages, many more survive that are somehow incomplete or fragmentary. In an oft-quoted passage, manuscript scholar Ralph Hanna argues that vernacular manuscripts should primarily be thought of as ‘fluid and developing entities’; rarely planned in advance, their contents often contingent on the availability of exemplars for scribes to copy, these manuscripts frequently contain blank spaces between, and even within, texts. In this context, blankness in manuscripts seems always to be a potential space for further writing. Opening the manuscript to the future, blank leaves and spaces are potential points of transition in a manuscript’s evolving history. The “Glastonbury Miscellany” is a particularly good example of a manuscript in which blank spaces became the site of further additions. These additions traverse the “great divide” between medieval and early modern periods; while taking the manuscript far from its original context of production, they attest to the ways in which tracing the lived existence of manuscripts might enable the broader project of rethinking periodization. Work began on the manuscript in the middle of the fifteenth century, with the Miscellany originally intended to be an account book for Glastonbury abbey: fol.1v includes a list of accounts, now largely illegible due to water damage sustained in the second half of the sixteenth century. This purpose appears to have soon changed as a number of more literary texts were added, including many that relate to the abbey’s abbots and monks, as well as its legendary founder Joseph of Arimethea. During the Reformation in the sixteenth century, Glastonbury abbey and the Glastonbury Miscellany experienced differing fortunes. On the orders of Thomas Cromwell, the abbey was visited by agents Richard Layton, Richard Pollard, and Thomas Moyle in September 1539. Stripped of its valuables and its abbot Richard Whyting brutally executed as a traitor in November of that year, Glastonbury abbey began its slow decline: masonry was removed from the abandoned buildings as they passed between private owners and by the first decades of the eighteenth century the site was already being described as a ruin. Around forty manuscripts survived the breaking up of the abbey’s library though, including the manuscript now know as the Glastonbury Miscellany. As the place of its production and the impetus for so much of its original contents began to crumble, the Glastonbury Miscellany itself continued to invite further additions and emendations. The Miscellany was still being added to in the 1560s, both in the spaces between and alongside those texts originally copied and, most extensively, in a number of folios later in the manuscript that remained blank after the efforts of the original scribe in the fifteenth century. One later reader in particular was responsible for much of the additional material incorporated into the manuscript in the decades after its removal from the abbey, adding seventeen further items of varying lengths, including (but not limited to) an acrostic poem, proverbial verses, and a short verse on the symbolism of colours. 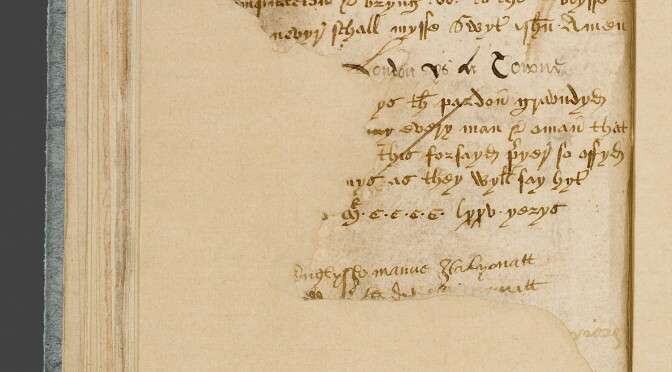 The last datable entry by this later reader was on the fourth of June 1561, a short note on a fire at St Paul’s Cathedral squeezed into a small space at the foot of fol.88r. The text above the note on St. Paul’s is a topical verse in two sections in the same hand. The first verse is an attack on Sir Richard Gresham, a mercer and former sheriff, alderman, and mayor of London and Member of Parliament who died in 1549. The second verse is a reply by author and schoolteacher Richard Sherry. These additions suggest a new urban environment for the manuscript: transferred to London, the manuscript had apparently become part of a new network of reading and use through which urban events and the fallout of political manoeuvrings co-exist alongside the monastic setting of the manuscript’s original composition. On other pages the earlier monastic and later urban locales occupy the same space. On fol.79v a note on English and French currency, specifically dated to ‘The Tenthe day of October Ao 2o Eliz[abeth]’ has been copied by the later reader/scribe in a small space at the foot of the page. This note has been squeezed into a space beneath a reproduction of a letter by Nicholas Frome, Abbot of Glastonbury from 1420 to 1456 and a short prayer, both copied by the original scribe in the fifteenth century. While this letter occupies a greater proportion of page, the later note gets the last word on the folio, both sequentially and temporally. Attesting to the inevitability of the future, these varied additions became part of the manuscript’s evolving contents. It would be overly simplistic though to read these later additions as a symbol of a monastic, inward-looking Middle Ages yielding to an increasingly urban(e) early modern world. Though predominantly focusing on the immediate context of the manuscript’s production, the original scribe did include a small number of texts concerned with detailing urban locales, including The Stores of the City, a description of seven English cities beginning with London that mixes Latin and Middle English. In turn, the later readers did not only add new texts in the blank leaves and spaces, but also historicised those texts copied by the original scribe, adding marginal comments in the form of proverbs and other notes and titles and attributions of authorship where they were absent. While the numerous later additions attest to the openness of blank leaves to further writing, these notes and titles attest to a simultaneous desire on the part of the manuscript’s sixteenth-century readers to interact with and codify its earlier contents. Far from simply attempting to wrench the manuscript from its original context of production, its later readers seem to have been conscious of their position writing in the pages of a manuscript of such varied content, caught in the midst of a recent past and an uncertain future. I would like to close by briefly noting a form of blank space in the manuscript as it now survives that (in all likelihood) will not be the location for any further writing: those blank leaves added to the manuscript more recently to ameliorate the damage it sustained in the second half of the sixteenth century and at later points in its history. This damage makes it difficult to reconstruct the exact sequence of additions made by the numerous hands that followed the original scribe in the pages of the manuscript. It is unclear how many other texts have been lost, texts that may have given us an even fuller understanding of the interactions, contrasts and tensions between the manuscript’s original contents and those later additions in the inviting blank spaces that remained after its initial production phase. For all the Glastonbury Miscellany tells us about how medieval manuscripts continued to be read and added to in the fifteenth and sixteenth centuries, the blankness of those modern leaves on which particularly badly damaged folios have been mounted during its restoration is a small reminder of all that we have lost from our period of study.